How valid was the Miller Urey Experiment? Mosses: Possibly the earliest land plants? What were the earliest land animals? Insects: The greatest conquerors of all? Plants and Insects find "mutual benefit"
The most bizarre pollination systems? Chitin: A secrete ingredient for success? 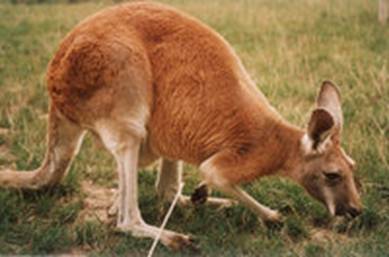 There are some forty different species in the kangaroo family. The smaller ones are usually called wallabies. The largest is the red kangarooMacropus rufus which is as tall as a man and the largest living marsupial. Kangaroos reproduce in much the same way as the opossums. The egg which is still enclosed in the vestiges of a shell a few microns thick and has only a small quantity of yolk within it, and descends from the ovary into the uterus. There, lying free, it is fertilised and begins its development. If this is the first time that the female has mated, the fertilized egg does not stay there long. In the case of the red kangaroo it is only thirty three days before the neonate emerges. Usually only one is born at a time. It is a blind, hairless an only a few centimetres long; its hind legs are mere buds, but its forelegs are better developed and with these it hauls its way through the thick fur on its mother's abdomen. The neonate's journey to the pouch takes about three minutes. Once there, it fastens on to one of four teats and starts to feed. Almost immediately, the mother's sexual cycle starts again. Another egg descends into the uterus and she becomes sexually receptive and she mates and the egg is fertilised. But then an extraordinary thing happens, the egg's development is temporarily halted. Meanwhile, the neonate in the pouch is growing prodigiously. After 190 days, the baby is sufficiently large and independent to make its first foray out of the pouch. From then on it spends increasing time in the outside world and eventually, after 235 days, it leaves the pouch for the last time.